My homegirl Mary of Alpineberry is hosting this month’s Sugar High Friday, and she picked an appropriately summery theme: Tropical Paradise. It’s been lusciously sunny this weekend, but when the fog rolls in, especially on the western side of the city, San Francisco can seem a very chilly place to spend summer. So how better to transport myself back to paradise than with this stunner of a dessert from Kate Zuckerman’s The Sweet Life : an island of passion fruit soufflé glacé in a sweet sea of chilled pineapple soup, dotted with an archipelago of strawberries and peaches. Zuckerman names her soufflé glacé so (it means frozen souffle) because her airy concoction is made of a passion fruit curd base combined with whipped egg whites, similar to a soufflé, as well as whipped cream. The resulting fluffy mixture is frozen into something like a French parfait but even lighter and dreamier. If you remember my semifreddo post, this is yet another just-as-good-as-ice-cream frozen dessert that does not require an ice cream maker! As an ardent fan of passion fruit, I found this recipe a spectacular expression of the passion fruit’s heavenly sweet-tanginess. Using passion fruit in both the curd and in the meringue creates a multilayered intensity of flavor, while combining whipped cream and a meringue gives the end result a wonderful smoothness and lightness – it dissolves in your mouth like cares melting away on a sunny beach. It’s also great fun to make – the passion fruit curd itself is a wonderful thing in itself, tart and buttery bliss for morning toast, while making the meringue involves whipping egg white and creating a passion fruit-sugar syrup. Sounds labor-intensive, but actually the entire thing can be made fairly quickly, and if you make it in the morning, you have a frozen dessert by evening! The soufflé glacé is marvelous in itself, but it’s possible with a little more effort to make it into a dessert, as Zuckerman does by pairing it with her chilled pineapple soup. Pineapple and passion fruit is one of my favorite flavor combinations – another reason I found this recipe irresistible. Making pineapple soup is the easiest thing imaginable; the most effort you’ll spend is cutting the pineapple up, and you’ll also have the heady scent of cooking pineapple to perfume your kitchen and help complete the transport to paradise. The cooked pineapple is pureed and strained – the resulting liquid, chilled, laced with hints of vanilla bean, is sweet, rich, and delightfully refreshing, a nice complement to the lightness and tanginess of the passion fruit soufflé glacé. Add some diced strawberries and peaches for textural interest and color, and you have the perfect instant tropical vacation – palm trees not included. For the curd: Make a bain-marie by heating a saucepan of water on the stove. Whisk together the egg yolks and sugar in the bowl for the bain-marie. Add the salt and passion fruit puree to the yolks and whisk to combine. Place the bowl over the simmering water and whisk constantly for about 5-8 minutes, until the mixture has thickened and holds the lines from the whisk. Remove bowl from heat and place in an ice bath until it has cooled to warm. Add in the butter and whisk until completely combined into the curd. For the meringue: Whip the heavy cream in a stand mixer to soft peaks. Store the whipped cream in the refrigerator. Place the egg whites In a clean stand mixer bowl and whip on medium-high with the whisk attachment until it starts to foam. Add the cream of tartar and continue whipping until soft peaks start to form. At this point, combine the passion fruit puree and 1/2 cup plus 2 tablespoons sugar in a small saucepan and heat on stove on high until it comes to a boil. While the passion fruit syrup is boiling, carefully add in the remaining one tablespoon of sugar to the whipping egg whites, a little at a time. The egg whites should get shiny and gain in volume – be sure to watch that they do not overwhip while the syrup is cooking. When the temperature of the passion fruit syrup has reached 245 degrees F, remove from heat and carefully pour down the side of the mixer bowl while the mixer is still running. Let the syrup combine with the egg whites and continue whipping for about 6 minutes until the meringue has cooled to room temperature. It should be very thick and glossy. Place the passion fruit curd in a large bowl. Scrape the whipped cream on top and carefully fold into the curd with a rubber spatula, taking care not to deflate the whipped cream too much. Scrape the meringue on top of the mixture and incorporate in the same manner. Pour the mousse into desired glasses or molds and place in the freezer for at least 4 hours to set. I use silicone molds that make it easy to unmold the shapes when they are frozen. The frozen mousse will keep in the freezer for about 1 week. Cut open the vanilla bean and scrape out the seeds. Place the seeds and pod in a large saucepan. Slice off the top and bottom of the pineapple. Carve off the skin of the pineapple. Cut the pineapple down the center and then each half into 1/2 thick slices. You don’t have to be precise as the pineapple will be pureed later but keep the pieces similar-sized so they will cook evenly. Place the pineapple, sugar, and 1 1/2 cups water to the saucepan. Bring the mixture to a simmer and cook for about 5 minutes. Remove the saucepan from heat. Remove the vanilla bean pod. Take about half the pineapple and place into a food processor. Add a little of the cooking liquid, and process until the pineapple is mostly pureed. Strain the puree into a container, using a ladle to push as much of the liquid through the strainer as possible. Repeat with the rest of the pineapple. Chill the strained liquid in the refrigerator. 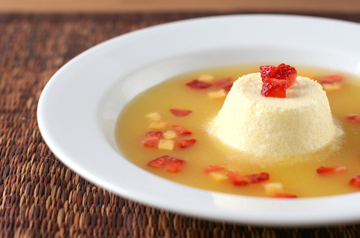 When you are ready to serve, ladle into bowls, place a scoop of the passion fruit soufflé glacé in the center, and add some diced strawberries, peaches, mango, or fruit of your choice. This is definitely calling out tropical!! Looks and sounds spectacular. Now that is one island I wouldn’t mind being stranded on! You would do it devinely! That is just insane. This should be served in the finest island restaurant. Fantastic. This dessert looks awesome! I LOVE passion fruit. This looks absolutely gorgeous, and makes a lovely addition to SHF. Like you, I do love the sweet and tanginess of passion fruit. Love Kate Zuckerman’s book and this is such a great interpretation of her dessert! It is indeed stunning! It’s been so foggy out here on the west side lately. But your dessert is like a ray of sunshine! Thanks for participating. 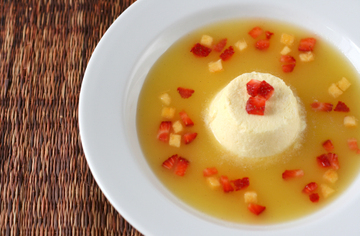 A creamy goodness island surrounded by yummy fruit soup…excellent. mmmm passion fruit and pineapple! two summer favorites. 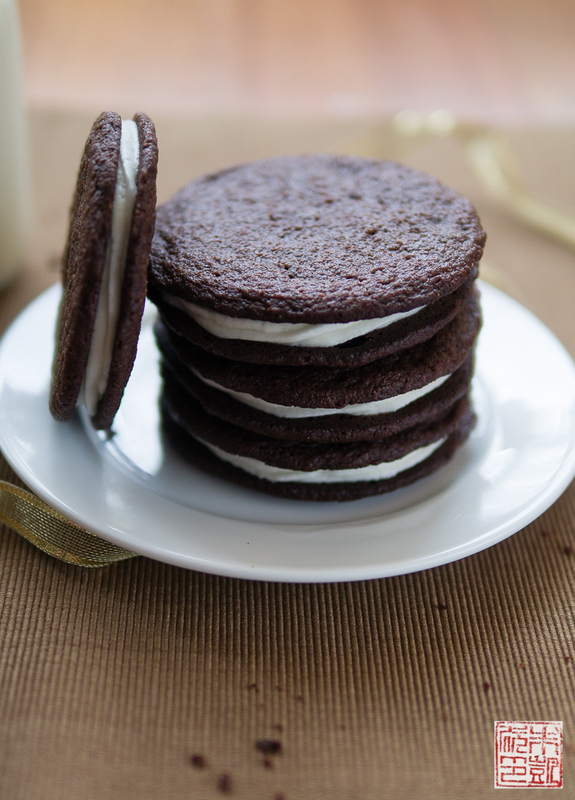 i really need to start baking from my cookbooks more often…. Thank you! I really liked putting all of the components together! Thank you! This dessert makes me think of Hawaii! I think the pineapple soup is pretty delicious myself! Thank you! It was a really fun dessert to put together! Passion fruit is one of my favorite flavors too – I need to bake more with it! Thank you! I’m looking forward to seeing all the other entries! Thanks for hosting! I’m looking forward to seeing all the other entries!! Mmm…you make a perfect menu writer! Thanks! I love those two flavors too – like being on vacation when I can’t leave home! i have to add my own voice to the chorus – it looks wonderful and i can taste the sweet acidity from the passionfruit and pineapple by just looking at it!